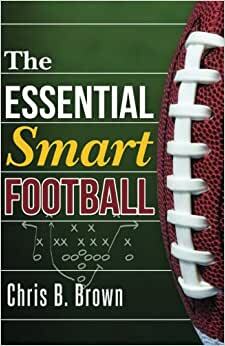 The Essential Smart Football is an examination of football's most important strategies and ideas, through the lens of the game's best coaches, players, and schemes. Brilliantly written and eschewing unnecessary jargon and technicality, it makes a major contribution to our understanding of football to help all of us -- coaches, players, and fans -- appreciate the game we love all the more. Mike Leach's pass-happy "Air Raid"
Nick Saban's school of defense. The book also includes explorations of modern approaches to the West Coast Offense, evolutions in defensive fronts and coverages, the changing role of the running game in spread and pro-style offenses, and much more. "Buy this book if you love football." "[Chris Brown] has put together a book that you need to buy if you're a football fan with a pulse." "I'm a better coach after reading this book. A must have in every coach's library!" "If you're a football geek, this is a mandatory purchase." "Advanced stats are great, but they mean a lot more when you understand where the players are moving on the field and why. Nobody has taught me more about where the players are moving on the field and why than Chris Brown." "Must-have new book for any football fan." Comece a ler The Essential Smart Football (English Edition) no seu Kindle em menos de um minuto. Chris B. Brown writes and edits Smartfootball.com and is a featured contributor to Grantland/ESPN. He has also contributed to The New York Times, Yahoo! Sports, and Slate. He lives in New York City. I have followed Chris Brown's Smart Football website for years, and bought this book (actually 2 of them) knowing that many of the chapters in the book would be very similar to posts I had already read on his blog. What I was expecting was more of a reference book, something that I could flip through for refreshers on basic terminology and offensive and defensive schemes. Chris Brown has mentioned before that there aren't very many good general football strategy books out there, and I was hoping that his book would fill the void. It turns out that the book is mostly copies of blog posts already on his site. In many cases the only difference between the book chapters and the blog posts are the removal of diagrams and videos explaining certain concepts. The original blog posts were very informative, and I assumed that in buying the book I would get additional material- more diagrams/examples, better organization so that it could be used as a reference, etc. But that's not what this book is. Despite being disappointed, I didn't mind buying the book because of the enjoyment I have gotten out of his website. However, the information in the book is the same as the website, and, it turns out, the website is a better medium for understanding the concepts. I hope one day Chris does write a reference book on modern football strategy. 45 pessoas acharam isso útil. I have been a huge spectator football fan for years and thought I knew a lot about the game. It takes a book like this to show how little I really know. Unfortunately, the author seems to assume the reader is a coach, former player or professional sports announcer. He uses terms and talks about formations with X's and O's that were way beyond my understanding. I was hoping this book would help me understand the terms and formations better, not assume I already knew them and could therefore appreciate how the football geniuses took those to the next level. I'm sure the book has much to offer for the right reader. Indeed, the parts I could understand were quite interesting. But in my opinion, this is not a book that can be enjoyed by the average spectator fan. It seems geared toward those who have been or are currently involved in playing or coaching the game and know it from the inside. That is not a criticism but rather an observation. Just be aware of that before you purchase the book. This is an amazing book for football fans seeking to expand their technical knowledge of the game. It helped me know more about what's going on in the field before a play happens and why certain players line up in a particular way for a snap. It is more technical than I thought. The author writes a lot about some of the offensive and defensive formations used in the past and how current coaches have modified them. This is a good thing though because it's the kind of book you can read more than once and still learn something new. I learned way more by looking up the terms and people he wrote about. Highly recommend. I am an avid football fan trying to get more into the tactics and plays teams use and why. I am also interested in the evolution of the game and the differences between college and the NFL. This book is an excellent primer for all football fans, short enough to read in a few days but packed with useful information that made me want to read more. I also really enjoy the accompanying blog over my lunch hour at work. If you are not pretty familiar with formations, schemes, positions and basic football tactics you might find this a little hard to follow. But before reading this my only experience with these was the NFL website, specifically the Playbook videos which break down the previous weeks interesting plays, and I was fine (Also I'm British)! If my quest for football information tactics were a meal, this is just a starter, but a delicious one! The work was very insightful on the historical trace of both various defensive and offensive operational tactics utilized at both the collegiate and professional level of football. It highlighted the individual(s) who devised and implemented those tactics, and the coaches that would create variants or hybrids of the tactics to meet the ever changing demands of the sport. The author rides a fine line with the reader not to become overly complicated but in the same breath not simplistic in illustrating and breaking down the intricacies of the varying systems. This is an excellent work for both the casual and expert football observer.